Editor's note: Contact7 seeks out audience tips and feedback to help people in need, resolve problems and hold the powerful accountable. If you know of a community need our call center could address, or have a story idea for our investigative team to pursue, please email us at contact7@thedenverchannel.com or call (720) 462-7777. Find more Contact7 stories here. ENGLEWOOD, Colo. — An Englewood man is looking for a new place to live after speaking to Denver7 about a House bill that would help renters deal with unresponsive landlords. During our March 26 report on House Bill 19-1170, also known as the Residential Health and Safety Act, Denver7 spoke to Greg Stroud, a six-year tenant at Golden Nugget Apartments in Englewood. 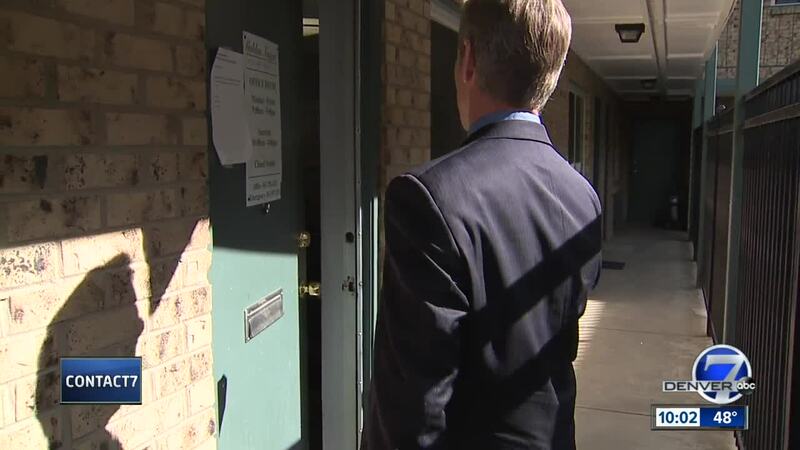 The day after the story aired, Stroud learned his lease would not be renewed. Stroud spoke in support of the bill and cited problems he had experienced at the Golden Nugget, which has been the subject of several Contact7 investigations regarding tenant complaints. "Anything to help the tenants that the owners can't kick them out because of one thing or another, I'm all for it, " Stroud said in the Denver7 report. A lease non-renewal notice greeted Stroud the following day. The letter does not state a reason as to why Golden Nugget management decided not to renew Stroud’s lease. He has to leave by May 31. When Contact7 attempted to ask management at the Golden Nugget if Stroud’s non-renewal notice was retribution or a coincidence, they threatened to call police. Stroud said he's not sure why he's being asked to leave or where he'll go, but he's trying to take the high road. And with the clock ticking, Stroud is facing an uncertain future. HB 19-1170 has bipartisan support and has already passed the House and Senate. It now heads to a committee to iron out the details. Gov. Jared Polis is expected to sign the bill into law in a matter of weeks.